Hello lovely people! Today I have a beautiful trio to show you guys, these are the polish con exclusives from Blush Lacquers that are exclusive to the event! I’ll have info at the bottom on how to get your paws on these pretties. These are inspired by the theme ‘glamping in Minnesota’ and crafted with a cool toned pallette of Minnesota’s wildlife and wilderness in mind. I’ll warn you, I think I might have found my favorite Blush to date here! Let’s start with the limited editions! Fireflies Under an Indigo Sky. 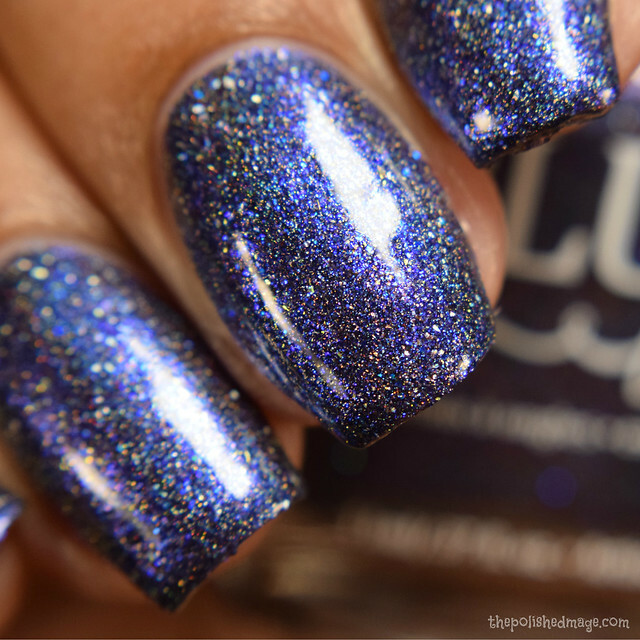 Official description: a deep indigo navy base with a blue microflake shimmer that subtly shifts to purple, holographic pigment, holographic microflakes, gold microflakes and small sapphire holographic glitters. Swatches show two coats with glossy topcoat. This one has a medium, slightly heavier feel during application, applies easily though. It’ll brush on your nails very opaque, and I can’t really see anyone needing to go to three coats for it, unless that’s personal preference. 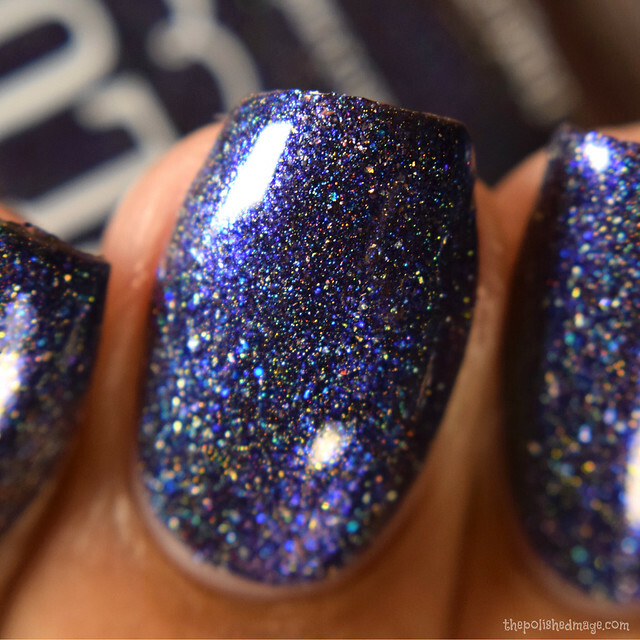 The base to me is an inky sapphire with navy undertones and all of those gorgeous flakes and glitters create a dusky night sky across your nails. No texture after topcoat, and sometime it can appear almost purple on extreme angles. It’s subtle, but when you see it- know that your eyes aren’t playing tricks on you. Thistle Bouquet. 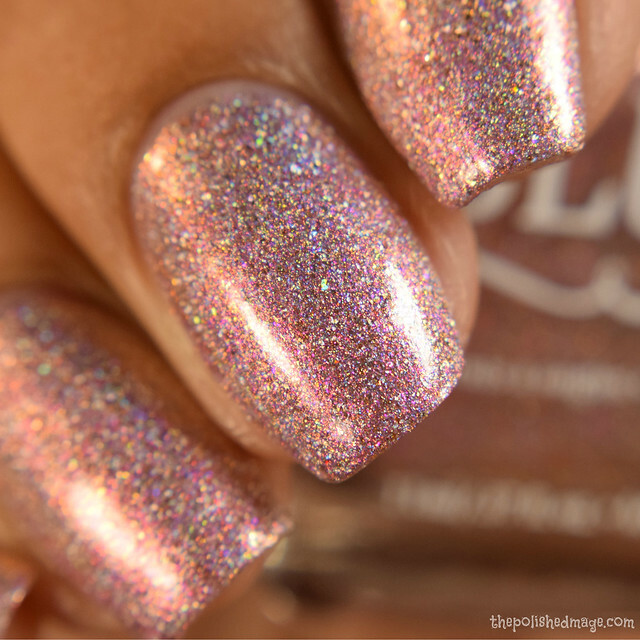 Official description: a mauve pink base with a pink microflake shimmer, holographic pigment, holographic microflakes, gold microflakes and small gold holographic glitters. Swatches show two coats with glossy topcoat. Formula has a medium feel to it and builds effortlessly. 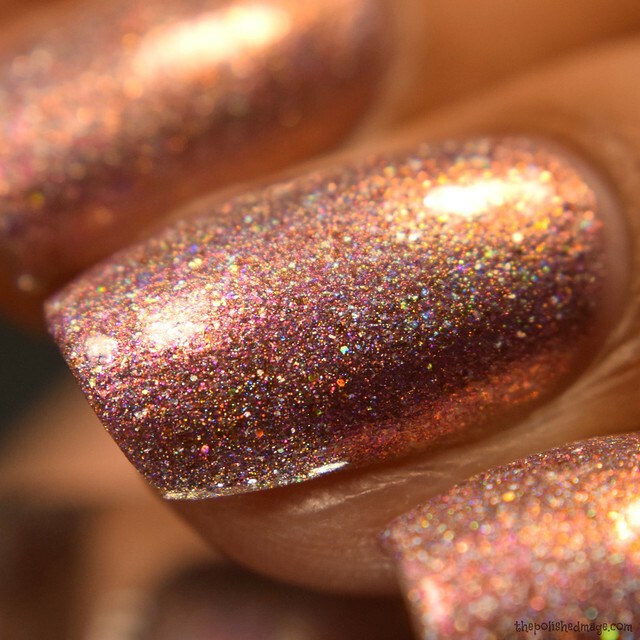 There’s a glorious shift to the shimmer in this one that flirts with a multichrome feel. I caught a gold shift to it, I tried catching it in my macros, and I think you can really see it in my side shot, and two finger shot. I don’t know you guys; I think this is my favorite Blush to date. I have a few holy grails from Victoria but this one is really fighting for that crown for me. 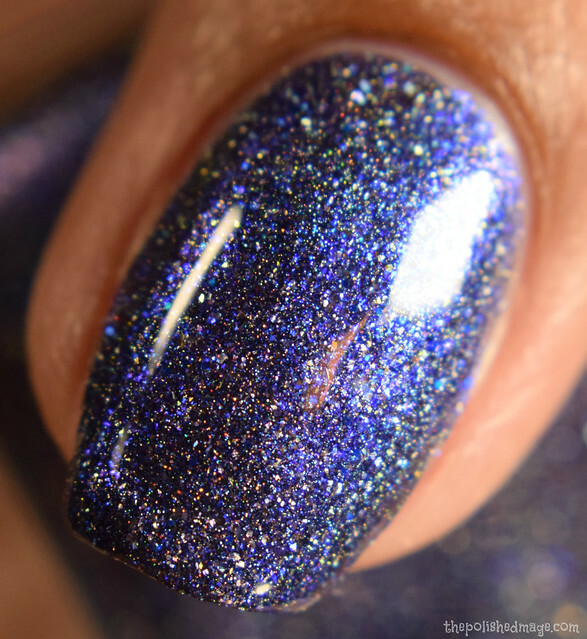 It’s truly one you must see in person, I highly recommend watching my swatch video for it. And now for the exclusive! Caribou Crossing. 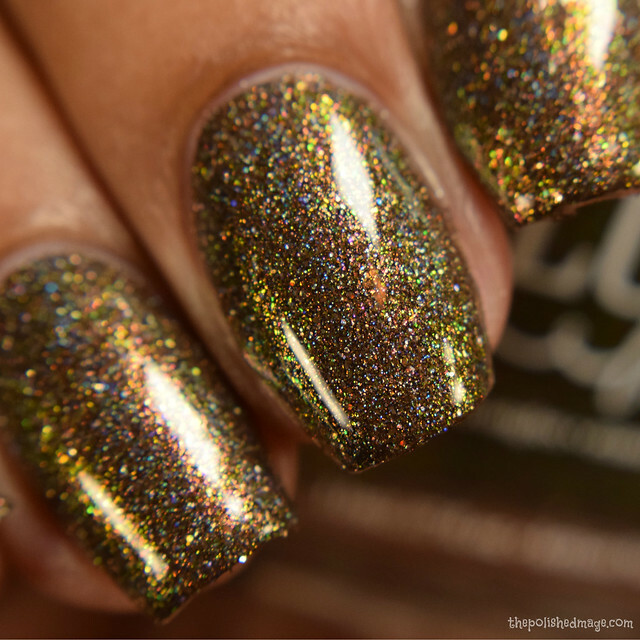 Official description: a deep espresso base with a pink to bronze to green shifting microflake shimmer, holographic pigment, holographic microflakes, bronze microflakes and small gold holographic glitters. Swatches show two coats with glossy topcoat. Formula has a rich feeling that applies very buttery and opaque to me. The base is a hot cup of coffee with swirls of mutlichrome shimmers. The shifts in Caribou are easy to catch and you’ll see a strong green to gold on tilt with an inner pink glow in bright lights. No texture after topcoat here either. All three will be available at Polish Con at Victoria’s table! Each will be $13 (which includes Minnesota tax). If there are any left over from the event they will be put up in the shop so keep your eyes peeled in the Facebook fan group when our girl gets back! I’ll also link you guys to the Polish Con group in case you were interested in purchasing polishes through a nail buddy.